The Institute for Maternal-Fetal Medicine offers comprehensive care and support to women facing high-risk pregnancies. Our board-certified OB/GYN and maternal-fetal specialists, along with an expert staff consisting of nurses, diabetes educators and a full-time genetic counselor, are committed to providing high-quality, compassionate care to women, newborns and their families in a comfortable and caring environment. Services extend from the moment of prenatal diagnosis to follow-up care for both mother and baby. The dedicated and caring staff has helped the institute earn AIUM (American Institute of Ultrasound in Medicine) Ultrasound Practice Accreditation (obstetric and fetal echocardiography), ADA (American Diabetes Association) accreditation (diabetes in pregnancy program), first trimester screening accreditation, and board certification in obstetrics and cardiology. Learn more by viewing our patient forms or viewing our photo gallery. To inquire about scheduling an appointment, please call 410-601-6370. If subsequent care is necessary, we suggest that you schedule your follow-up as soon as possible to have the best appointment selection with your provider. If you must cancel your appointment, we ask that you give us at least 24 hours notice. The specialists at the Institute for Maternal-Fetal Medicine discuss their passion for helping women with high risk pregnancies. Click on the images to watch the videos. 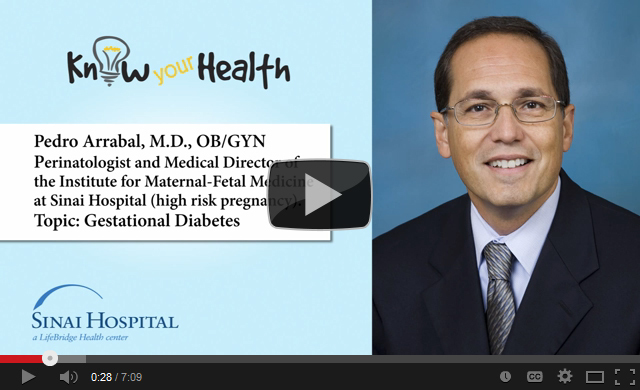 Dr. Pedro Arrabal discusses gestational diabetes and high blood pressure in pregnancy in these WBAL-AM "Know Your Health" videos.